Your thyroid gland helps regulate your metabolism and the amount of calcium in your body by secreting of iodine-containing hormones. An insufficient amount of iodine in your diet can cause hypothyroidism. Kelp is a type of seaweed that provides a rich source of iodine. An iodine deficiency is not the only cause of hypothyroidism, and self-medicating with kelp for hypothyroidism is not safe. For a correct diagnosis of the cause of your hypothyroidism, consult a doctor. Hypothyroidism means your thyroid gland is underactive and cannot produce the amount of hormones required for normal body function. The symptoms of hypothyroidism vary depending on the severity and duration of your condition. Hypothyroid symptoms tend to develop gradually over several years, according to information from the Mayo Clinic, and may worsen without medical treatment. Hypothyroidism symptoms include fatigue, heavier-than-normal menstruation, weight gain, depression, elevated blood cholesterol levels and brittle fingernails. A severe iodine deficiency can cause hypothyroidism, and kelp provides a natural source of this important mineral. If a doctor diagnoses an iodine deficiency as the cause of your hypothyroidism, taking kelp supplements may improve your condition, according to information provided by Dr. Todd B. Nippoldt of the Mayo Clinic. However, he explains that iodine deficiency is rare in developed countries like the U.S. because salt and other foods are fortified with iodine to ensure the population gets the recommended dietary allowance of 150 mcg per day. Hypothyroid patients should not self-medicate with iodine supplements and should consult their doctor before adding extra iodine to their diet. If you need iodine for hypothyroidism, your doctor will tell you how much you should take. The Langone Medical Center warns that dietary supplements containing kelp are unreliable sources of iodine. 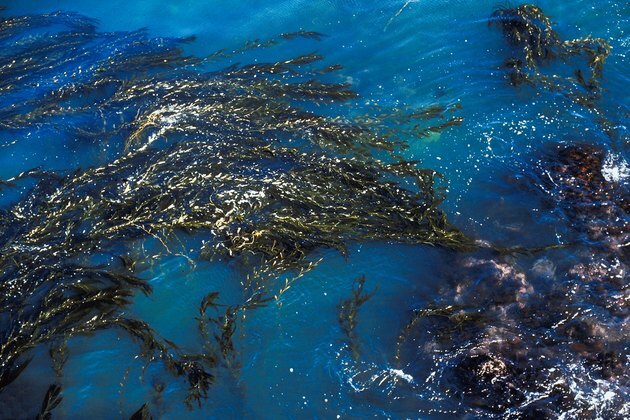 Kelp comes from the ocean and several factors, including harvest location and ocean temperatures, affect the amount of iodine in kelp. In fact, the amount of iodine in one kelp capsule can vary from 45 to 57,000 mcg – a level far above the RDA of 150 mcg – according to the Langone Medical Center. The Center warns that taking excessive doses iodine unnecessarily may make hypothyroidism worse and not better. Kelp adds iodine to your diet. High levels of iodine in your diet pose a serious risk to your health, according to a warning by Health Canada. Pregnant or breastfeeding women and people with thyroid disease have a higher risk than the general population. It warns that excessive iodine intake may cause an enlarged thyroid gland in unborn babies, which can result in obstructed breathing. If you think you have hypothyroidism, consult with your doctor for safe treatment options. Untreated hypothyroidism can lead to heart disease and infertility.